The NEW SOAKER PAW TOWEL is perfect for your dogs muddy feet, wet feet or even for their muddy/wet bodies when they come in from outdoors. 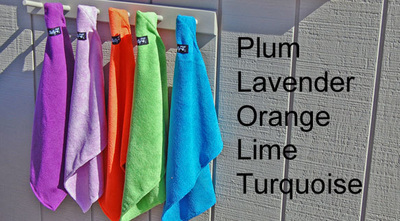 Made from our super absorbent micro fiber terry, the same fabric our Soaker Coats are made from. This fabric absorbs water and wipes away the unwanted dirt at the same time. Keep one hanging at every dog door in your home! Dimensions: 14" x 19". Each Towel is equipped with a corner flap for easy hanging and storage. 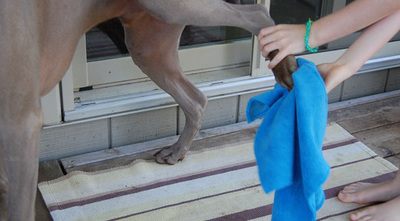 Partner the Soaker Towel with our Soaker Coat and you have two great tools to either cool your dog down or dry them off.